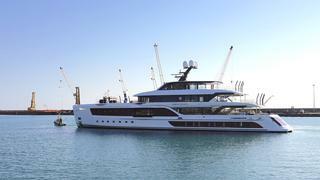 Admiral has launched its 55 metre hybrid superyacht Quinta Essentia. Quinta Essentia was designed to find the perfect balance between the four elements of nature: earth, water, air and fire. Her Michela Reverberi-designed interior keeps this concept at its core, while adding a Florentine-inspired theme to the yacht. 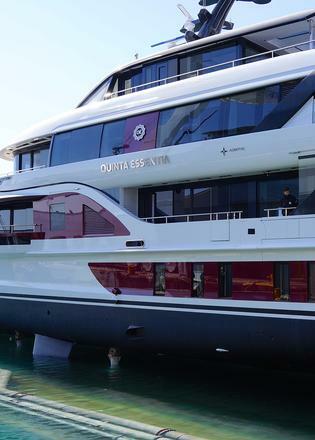 The layout of Quinta Essentia splits four different types of activity between her four decks. The lower deck has a huge swim platform and a large spa inside, featuring a steam room, sauna, treatments room, relaxation room and balcony. On the main deck, there’s a pool with waterfall that can fit 10 people, with an outdoor lounge and bar aft of the pool. Above, on the upper deck, lies the lofty main saloon with an indoor/outdoor area and space for alfresco dining. The top deck of Quinta Essentia has a spacious gym with massive windows and space to relax outside in a Jacuzzi. 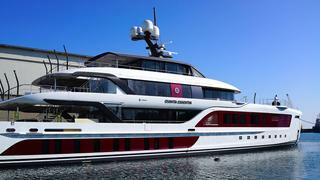 She can accommodate eight in two owners’ suits and two VIP suites. Each of the six suites on Quinta Essentia has been themed around the four elements of nature — the largest owner’s suite, for example, is a mixture of warm colours and textures that represent the earth element. A second owner’s suite, representing fire, is designed in burgundy and aubergine and accented with gold to recreate the warmth of the element. The two VIP cabins are completed in light blue and pearl grey with sea creatures and floral detailing to represent the element of water. With naval architecture from Vripack and exterior design by Dobroserdov Design, this full displacement superyacht is built in aluminium. Quinta Essentia uses hybrid propulsion, twin MAN 1,400hp engines and two 150kW electric motors to power her to an expected top speed of 16.5 knots and offer a range of over 6,500 nm at 9.5 knots. Quinta Essentia is for sale, asking €37,500,000 with Nakhimov.